Fill in the online cutting form below or click here for a printable version. If yes, please note which cuts you would like vacuum packed in the comments section below. 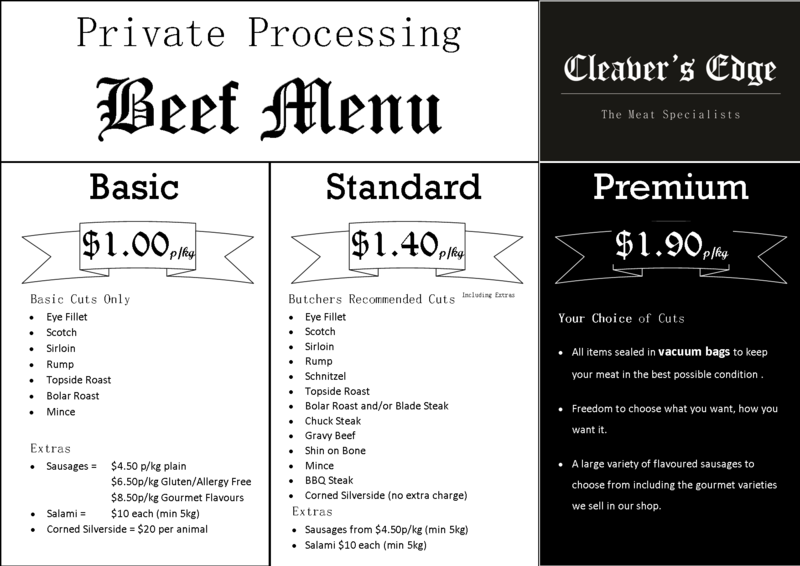 Cleaver’s Edge is Helensville’s premier butchery. We provide top quality, ethical meat cuts and small goods, Homekill processing services and Wholesale meat to local cafes, restaurants and bakeries. Retail Shop - Free Range NZ Beef and Lamb, Chicken and Pork. Homekill Processing - Farm to freezer: we manage the whole process. Wholesale Department - Competitive pricing and professional, quality service. Fundraising Suppliers - Feeding the masses for a good cause? We've got a great price!